“Surah Yusuf…”Abdullah whispered to himself in excitement. He placed the Qur’an slowly on his lap and turned the pages till he reached the twelfth chapter. The story of the Prophet Yusuf was mentioned in the glorious Quran and it was a story that always left him smiling and teary-eyed. Abdullah always wondered why Yusuf ‘alaihissalam was very special. So special that his name was mentioned in the Quran and an entire Surah had been named after him. He thought Abi had selected a beautiful name for his brother, Yusuf. Abdullah asked his mother about it. “Alif-Lam-Raa..” Ummi recited it with a melodious tone. Ummi and Abdullah continued reading it until they reached the end of Surah Yusuf. “The Muslims were getting tortured by the enemies of Islam, the Prophet ﷺ lost his dearest wife Khadijah (r)…” Ummi said in a low and sad voice. “SubhanAllah, the Prophet ﷺ must have been really upset.” Abdullah said with a sadly..
“The Quran said it clearly it is the the best of stories and true inspiration for Muhammad ﷺ and his followers”, Ummi explained. Abdullah read a story from one of his collections as he took from his well-arranged bookshelf in which he recently bought in a school Bazaar. “Okay Ummi, here goes the story”, Abdullah said looking thrilled to read them. “Yusuf (‘alaihissalam) had ten half-brothers from another mother, his real younger brother named Benyamin was from the same mother. His father, Ya’qub (‘alaihissalam) was a wise and noble man and treated his sons equally. Ya’qub was commanded by Allah to teach Islam to his tribe”, Abdullah read it in a loud voice so maybe he could catch his brother Yusuf’s attention next door. “Ya’qub (a.s) loved Yusuf (alaihis salaam) so dearly for his soft and kind nature”, Abdullah said. “It started when he was very young, he lived near Jerusalem; he was thrown in a dry well by his elder brothers due to jealousy and they plotted an evil plan against him” Abdullah said. 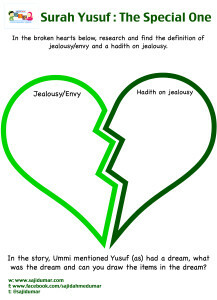 “So Ummi, Yusuf (‘alaihissalam)’s brothers were jealous of him and hated him?”, Abdullah was puzzled. “But, he was a young boy. That was so mean!” Abdullah exclaimed. “It is a human weakness to portray jealousy but we should not let jealousy overtake and poison our hearts, we should say ‘Alhamdulillah’ when we see goodness in someone or if Allah has favoured a person in wealth, intelligence or beauty. But we do not allow the seed of jealousy to grow in our hearts because it’s truly a dangerous feeling”, Ummi said to caution us from harbouring any ill-feelings towards anyone. “Yusuf (‘alaihissalam) was a loving, kind and gentle boy. One day, he had a dream; he dreamt of eleven stars, the sun and the moon were bowing to him. It was an unusual dream for him. His father Ya’qub ‘alaihissalam knew there lied a great and promising future for his little son”, Abdullah continued and paused a moment. “Ummi, that’s a strange dream to dream of the moon and stars prostrating to him”, Yusuf came into the room and listened to his brother Abdullah narrating the story. “Yes, Yusuf ‘alaihissalam could teach to interpret dreams, his dream of the sun, the moon and eleven stars was a sign of prophecy and to reach a high rank and status despite of him being sold as a slave at a very young age”, Ummi said. “Oh! My name, my name!” Yusuf was excited to hear his name mentioned over and over again, he was proud to carry the name of the amazing Prophet Yusuf (May Peace be Upon Him)..
“Hey Yusuf, you should be a great example okay”, Amimah said cheekily. “Yusuf (alaihissalam) was a handsome and an intelligent boy”, Ummi said. “I can relate to this, that’s why I am a striking handsome gentleman, you see Aminah”, Yusuf said to Aminah and stroke his hair and giggled. “Handsome is the one who has great character not just by the looks”, Aminah gave a powerful statement for she had seen many people who has the beauty or looks but lack good morals and character. “Yusuf ‘alaihissalam was special, he was not only handsome but he was a smart boy” Abdullah said. “May Allah grant you good traits just like the Prophet Yusuf (‘alaihissalam)”, Ummi said to Yusuf. ‘I’ve had many many many dreams but I don’t know what is the meaning behind it”, Yusuf said in a confusing manner. “Is there an interpretation to our dreams?” Aminah said in a curious tone. “Yes, Aminah. There are interpretations to some dreams in accordance to the Quran and Sunnah. A good dream is from Allah and evil dreams are from Shaitan”, Ummi said to Aminah. “Dreams can come true it can be a sign of comfort, relief and a good news to be discovered”, Aminah was overwhelmed and excited as she has seen a true dream before. “Ya’qub warned Yusuf ‘(alaihissalam) not to share his dreams from his wicked brothers, but he was an innocent child and narrated his vision like any happy child”, Abdullah said. “They were jealous that their father Yaqub ‘alaihissalam favours Yusuf over them and they felt they were more stronger than Yusuf ‘alaihissalam so they planned to kill him or throw him in a far away place…” Abdullah jumped on his bed as he continued the story. “One of his brother had a soft spot though, he said do not kill him, but let’s throw Yusuf in a dark well and a caravan will take him away”..
“However, Ya’qub ‘alaihissalam said a wolf might come and eat Yusuf (alaihissalam) while they were off guard”. “They persuaded their father and said they were strong grown-up men, and it would be a shame for them as they were many of them, they will die before the wolf could eat Yusuf”..
Aminah was shocked to hear the struggles and fears which Yusuf (‘alaihissalam) would experience later on. may allah reward you for this post. ive always believed yusufs story makes you feel better no matter what your going through. infact its as if your reading to allah him self your story. and you cry and smile but all worth it. im a muslim african who is raised in the west since 4yrs old. ive been strugglimg with my inner self these last 10 or so years. ive gt a good job through my hard work and allahs blessings but i still dont feel satisfied with my own achievements coz of what i lacked to achieve. its something that i cant let go thinking. Now allah has blessed me with a child and beautiful wife who reverted, so the focus is on them. i just think we forget that even the prophet Musa A.S was on his own and Allah read his sadness and made Haroun A.S his brother a nabii. so reach out to your brothers and sisters from all walks coz that could be the thing that grants you jannah. and yes its true. a life without the rememberance of allah and his propher p.b.u.h, would be a life of distress..
p.s. i am slowly recovering and its through the help of allah do i jave hope and my wife and beautiful daughter do i have strength.